This is Florence’s story, one of five stories extracted from THE SWEETHEARTS.Whether in wartime or peace, tales of love, laughter and hardship from the girls in the Rowntrees factory in Yorkshire. “Florence was born in 1923 and remembers sleeping three or four to a bed with the other children. ‘If it was really cold, my mum would give us the shelf out of the fireside oven, wrapped in a piece of cloth, as a hot water bottle. She’d put it right in the middle of the bed where all four of us could get our feet on it’. 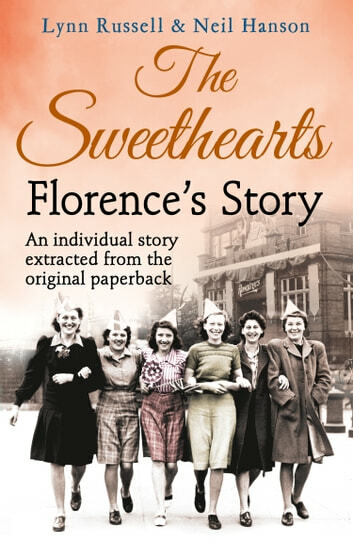 Florence finished school on a Friday in July 1937 and started work at Rowntree’s the following Monday. ‘There were so many people pouring in through the gates,’ Florence recalls, ‘and the whole place was so huge – even the rooms were enormous – that I couldn’t imagine how I was ever going to find my way around the place…” From the 1930s through to the 1980s, as Britain endured war, depression, hardship and strikes, the women at the Rowntree’s factory in York kept the chocolates coming. This is the true story of The Sweethearts, the women who roasted the cocoa beans, piped the icing and packed the boxes that became gifts for lovers, snacks for workers and treats for children across the country. More often than not, their working days provided welcome relief from bad husbands and bad housing, a community where they could find new confidence, friendship and when the supervisor wasn’t looking, the occasional chocolate.